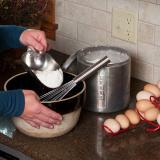 Durable aluminum scoop with a front facing handle. So strong and handy that it may be the last feed scoop we’ll ever buy. 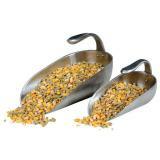 Small scoop is useful for scooping out of small bags or into small poultry/animal feeders. 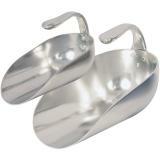 Also can be used to scoop flour for baking. Large scoop handles everything from dog food to shelled corn. Unique placement of the handle allows it to hook onto gates, fences, or panels for storage. Position of handle allows for better weight distribution on user's hand and forearm. A fortified trace mineral premix for sheep. Provides critical micro-minerals for maximum flock health and immunity. A complete trace mineral premix for goats. Contains additional copper with no added molybdenum for better milking production. Formulated specifically for goats destined for market. Maximize gains for a better return at sale. Fortified trace mineral premix for starter, grower and finisher lamb feed rations to maximize health and immunity. A great way to reward the flock with delicious treats from the garden all year long. 1.5 gallon capacity mineral feeder for providing mineral and nutrient supplementation to sheep and goats. Use this handy tray to provide a clean area to feed and water day old chicks. Easy to clean and heavy-duty. An inexpensive, easy to fill feeder for chicks. Roost-guard stop chicks from roosting. Feed up to 21 chicks. An adjustable feeder. Fold the legs under the feeder when feeding chicks. Raise the legs as they grow. Can be used with waterfowl. 5 lb capacity. Use this feeder to provide grit and oyster shell to poultry, game birds and waterfowl. Use with small flocks of poultry. Grill reduces feed waste. Mounts to either a fence post, poultry coop wall or tree. Feeder capacity increased by a silo extender. Suitable for pellets, wheat, barley and maize. 26 lb capacity feeder for feeder small to medium backyard poultry flocks. Supplied with push-fit legs that elevates the feeder 3" off the ground. 55lb capacity feeder for large poultry flocks and waterfowl. Use coarse feeds in humid areas to reduce binding of feed. Though able to serve the needs of many species, our interest in them is their use for indoor feeding of grain, pellets and mineral to sheep and goats. Durable trough feeder designed specifically with goat behavior in mind. Reduces waste and promotes animal safety. I love this thing! So easy to scoop feed out of the feed bags and get it to the buckets or troughs or whatever without spilling. Should last forever. Highly recommend over the plastic ones or any other scoop where the handle sticks out from the end of the scoop. I got the large and it works fine for getting feed out of the 50# bags. Great scoop. Noticeably faster dispensing feed. Great little tool for scooping from buckets and filling small feeders. I love how it hangs from the bucket so it doesn't get lost. I like it so much I'm going to order the larger version to scoop from the feed bins into the buckets. 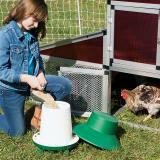 And I'll add that the large scoop is great for filling buckets from trash cans where I store the feed. Love the engineering on the scoop handle. I have small hands and I was so tired of scoops with the handle that juts out the back, because my hand didn't have the power to comfortably lift a full scoop out of the feed. 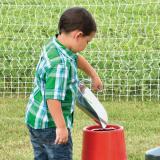 This scoop is a breeze and the right size for buckets or feed bags.